Will I Gain Weight From Hot Dogs? At the most basic level, the secret of a healthy diet is simple -- eat plenty of vegetables, fruit and whole grains; get your protein from lean animal sources, fatty fish or protein-rich plants; limit junk foods; and don’t consume more calories than you need. While even the cleanest diet has room for the occasional indulgence, giving in to an ongoing craving for less nutritious fare can diminish the overall quality of your diet, possibly leading to undesired health consequences like weight gain. Hot dogs, which are a classic example of junk food, should be considered a periodic treat -- particularly if they’re loaded with condiments and accompanied by cola and potato chips. Americans consume three times more meat than the global average, and processed meats, including hot dogs or frankfurters, make up more than 20 percent of the total meat intake in the United States. Given such a high demand, you’ll find a wide variety of hot dogs on the market, ranging from the classic pork variety to all-beef dogs, turkey or chicken dogs and mixed-meat varieties. How many calories you consume when you eat a plain hot dog depends on its size and how it’s manufactured -- an average-sized pork hot dog provides about 200 calories, according to the U.S. Department of Agriculture, while an all-beef hot dog supplies closer to 160 calories, and a turkey hot dog has about 100 calories. Because you’ll get about 120 calories from a traditional hot dog bun, eating a plain, average-sized hot dog can contribute anywhere from 220 to 320 calories to your daily diet. In the context of a calorie-balanced diet, eating the occasional plain hot dog isn't likely to promote weight gain. Although there’s an exception to every rule, it’s rare to see a hot dog garnished with lettuce and served with a tall glass of ice water and a side of steamed broccoli. In reality, hot dogs are often smothered in calorie-rich condiments and accompanied by a sugary beverage and more junk food, like potato chips or fries. An average-sized pork hot dog on a plain bun with 2 tablespoons each of ketchup, relish and cheese sauce has just over 440 calories; serve it with a 16-ounce cola and a 1-ounce bag of potato chips and your meal will deliver a whopping 800 calories. For someone on a 2,000-calorie diet, that’s the equivalent of eating 40 percent of the day’s calories in one meal. If junk food is a rare treat for you, indulging in the occasional 800-calorie lunch -- even if it’s low in nutrients -- probably won’t affect your health too much, apart from a possible case of heartburn. If, however, you're indulging in hot dogs or other "junk" foods more than once a week, your cravings might just set you on a path to weight gain. The typical Western-style diet -- which is low in vegetables, fruit and whole grains and high in red and processed meats, sugary drinks and refined carbohydrates -- has been linked to weight gain and obesity. A prospective analysis of three large cohort studies published in the New England Journal of Medicine in 2011 found that the regular consumption of specific foods, including potato chips, potatoes, sugar-sweetened beverages, unprocessed red meat and processed meats, is strongly associated with long-term weight gain. The American diet is high in sodium, but you should be eating less than 2,300 milligrams per day. Like most processed meats, hot dogs contain a substantial amount of sodium, and as a result, they can trigger sodium-related water retention. By itself, a plain, average-sized pork hot dog on a bun has about 840 milligrams of sodium; add 2 tablespoons each of ketchup, relish and cheese sauce, and your hot dog will deliver more than 1,700 milligrams of sodium. Serving it with a bag of chips and a 16-ounce cola pushes your sodium intake closer to 1,900 milligrams. While someone who is sensitive to sodium can retain water after just one sodium-rich meal, a high-sodium diet can lead to chronic water retention and high blood pressure. 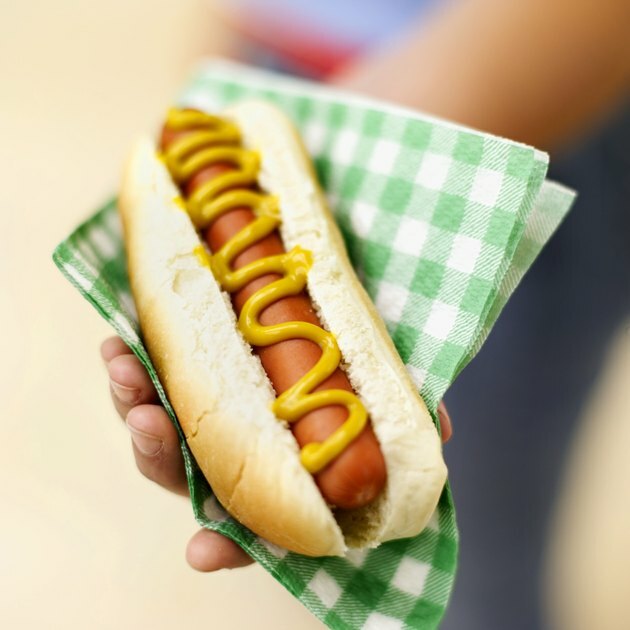 Weight gain isn’t the only -- or even primary -- health concern when it comes to eating hot dogs. In 2015, the International Agency for Research on Cancer, the cancer agency of the World Health Organization, made a statement that classified processed meat, or meat that has been cured, salted, smoked or treated in some way for preservation or flavor, as a carcinogen, or something that causes cancer. Processed meat has been specifically linked to a higher risk of colorectal cancer, and it may also be associated with stomach cancer. According to the American Cancer Society, eating 50 grams of processed meat a day -- or the equivalent of one hot dog -- increases your risk of colorectal cancer by 18 percent. Eating processed meat may also increase your risk of heart disease and type-2 diabetes, according to a 2010 study conducted by the Harvard School of Public Health. The study, which was a meta-analysis of about 1,600 studies, found that eating 50 grams of processed meat a day was associated with a 42 percent increased risk of heart disease and a 19 percent increased risk of type-2 diabetes. Is it Okay to Eat Hot Sausage During Pregnancy?